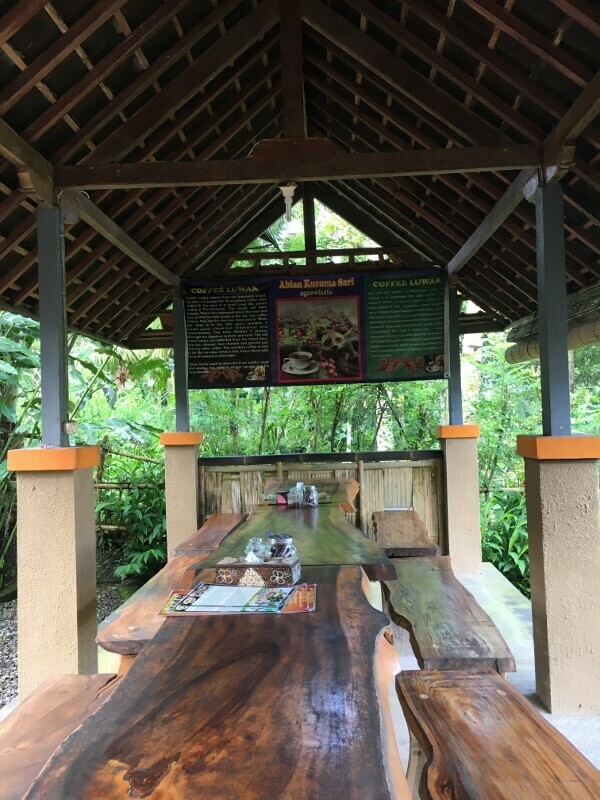 Finding things to do in Bali with kids that will suit the whole family is always a tricky task. 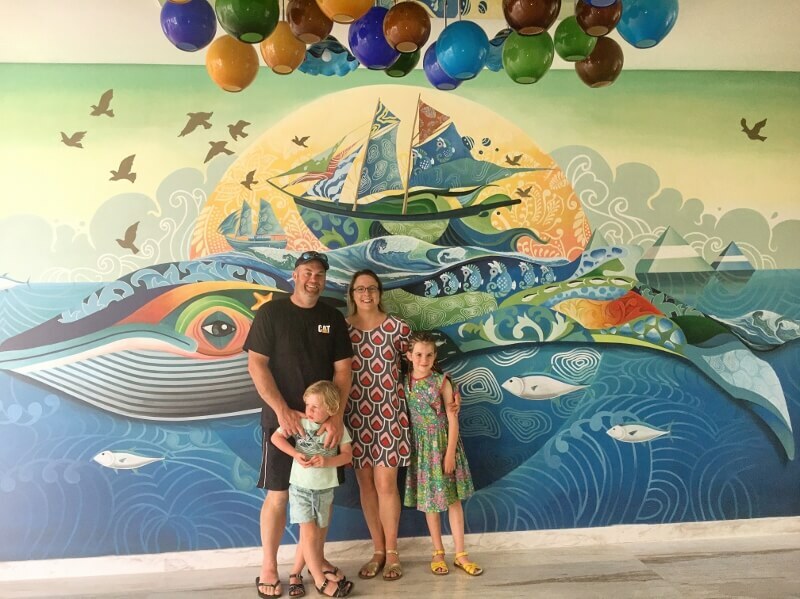 Depending on the ages of your kids, you may worry that the activity won’t suit all ages. 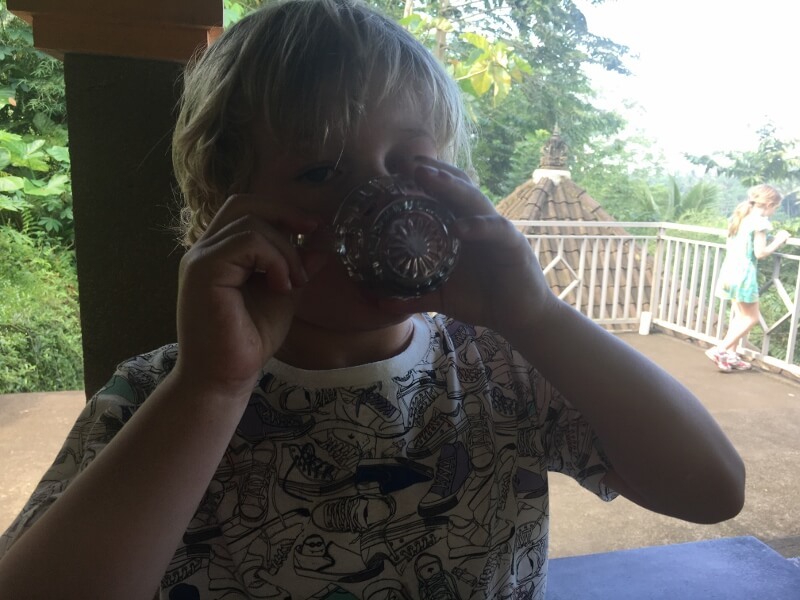 On our recent extended family trip to Bali, we found something that suited all ages. 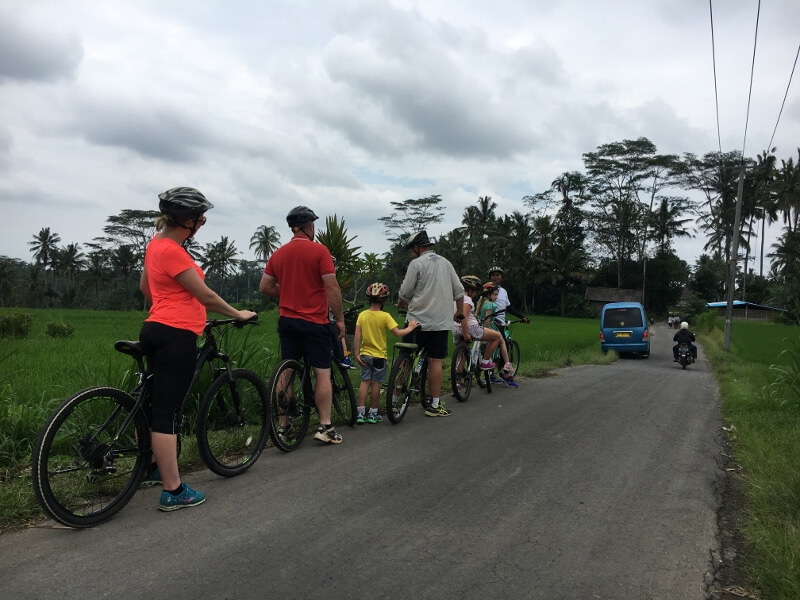 Our Bali bike tour with Ubud Cycling Bike was excellent and we all had a lot of fun. 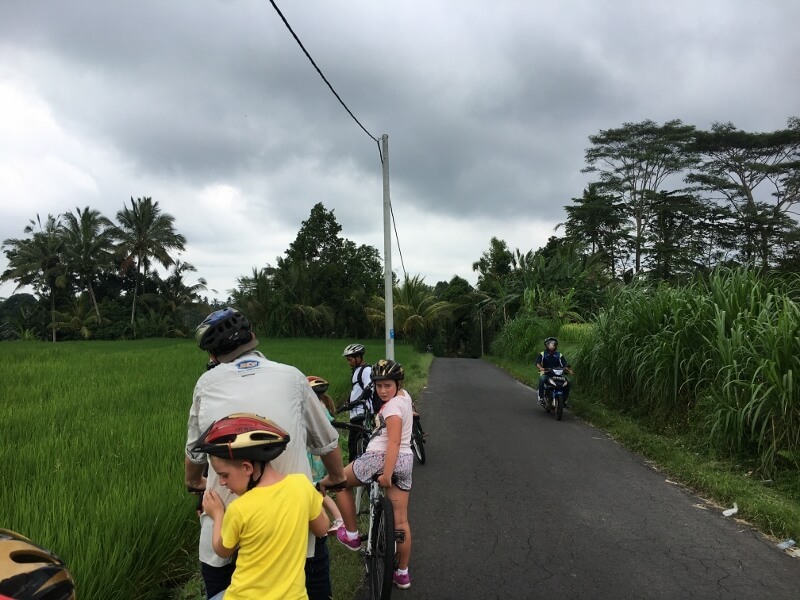 Cycling in Bali can seem daunting and you can think how will we manage it with kids! 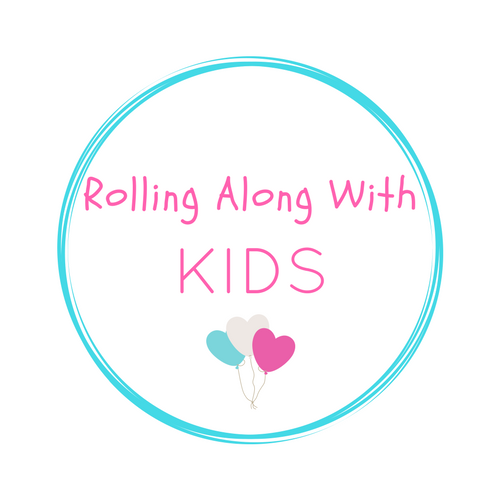 Read our review to find out how we managed with 5 kids aged between 18mths and 8 years. 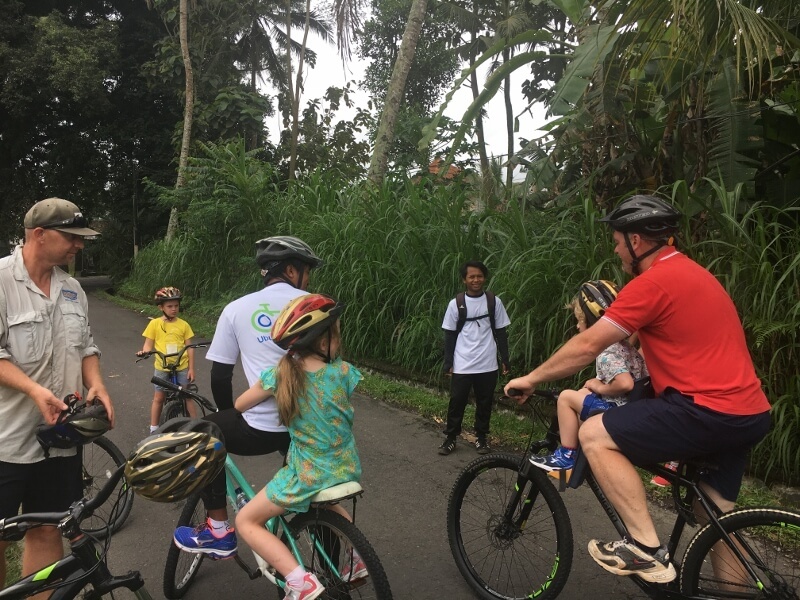 For our Bali cycling tour with Ubud Cycling Bike it cost 450,000rp per adult (~$45aud) and 300,000rp per child (~$30aud). This may vary from tour to tour so check with them for a quote depending on the needs of your group. 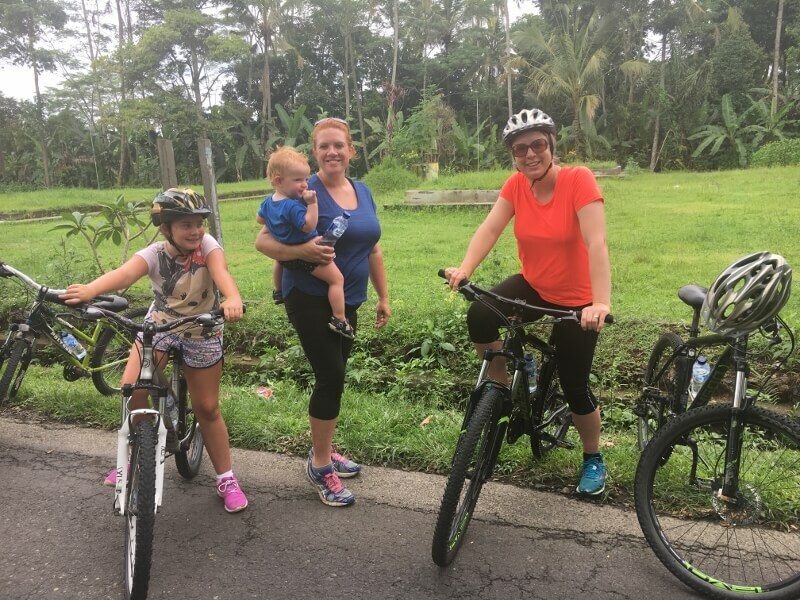 The tour we organised was just for our family and my sister in laws family, so meant we could tailor to bike tour to our needs. 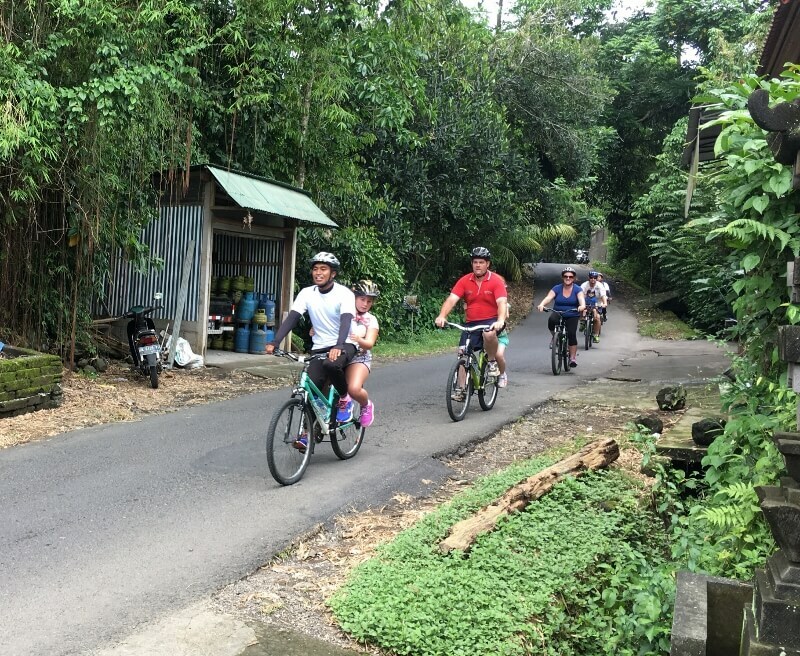 One of the reasons that I think this is one of the best things to do in Bali with kids, is that every age can be included in a Bali bicycle tour. Babies or the elderly that can’t ride a bike: During the whole tour a bus followed us riding our bikes. It was available for anyone to use if they got tired or needed a break. When we first started riding the 18mth old in our group needed a nap so he and his Mum hopped into the van while we were riding our bikes. Babies or toddlers that want to go for a ride: The bikes were fitted with toddler seats on the front of the bikes. This made it fantastic to make sure they were safe and even Mason at 4 years of age, he is a tall boy, fit in the toddler seat. They have helmets for all ages. 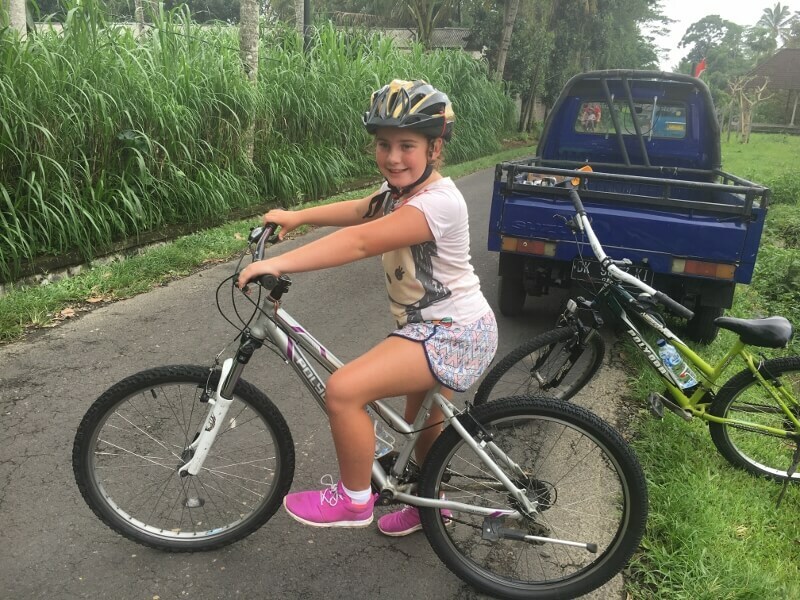 Kids that aren’t confident at riding: Charlotte came under this category and even though she was 7 years, she is not an overly confident rider. This was no problem at all as she could be dinked on the back of a bike. 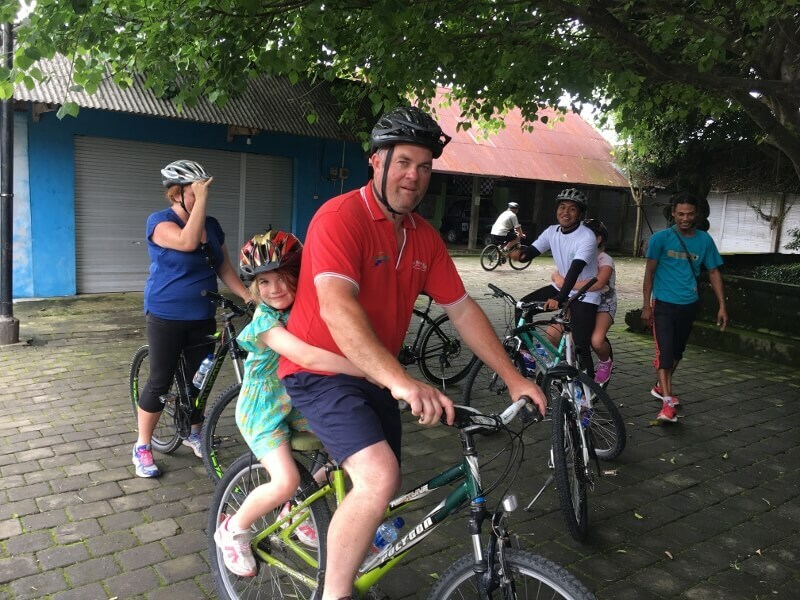 Kids that are confident at riding: Kids bikes were supplied. 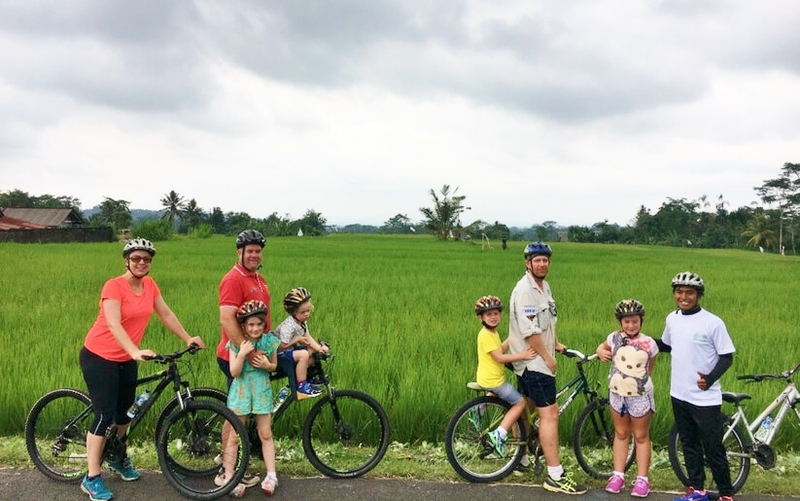 This was not just a Bali bike tour but it also included a full culture experience for the whole family. 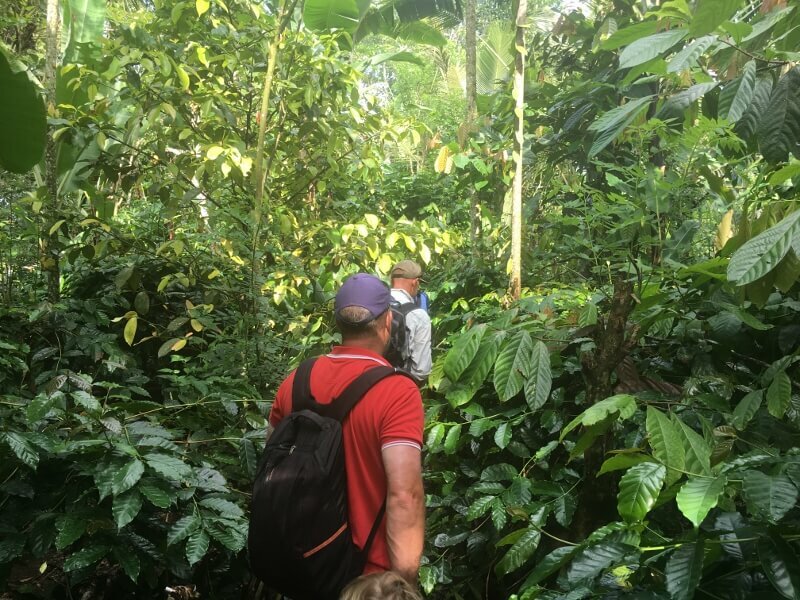 Here is the list of activities that we did on our tour that suited our family group. 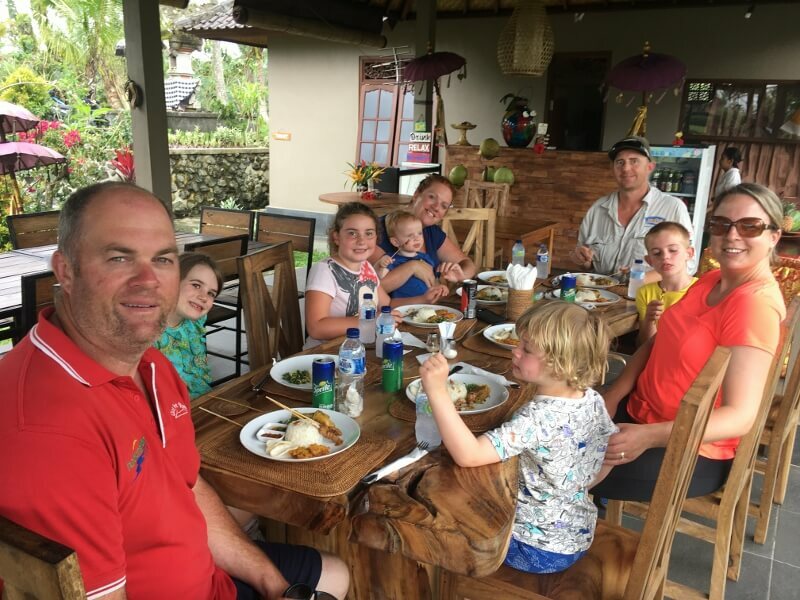 Here is an overview of our tour on 23rd November 2017 and why we think it is one of the best kids activities in Bali. 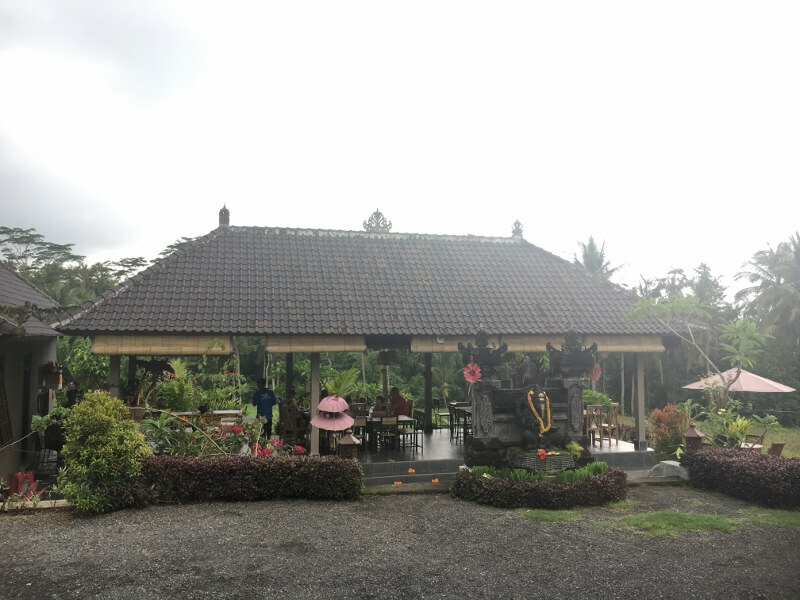 We were picked up from our accommodation at Padma Ubud Resort at 7:45am by a 12 seater bus. 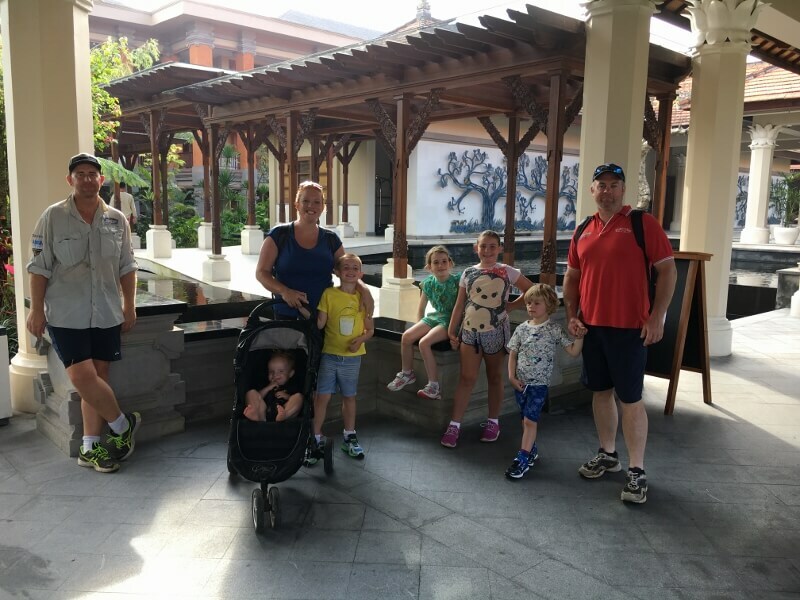 There was plenty of room for our group of 4 adults and 5 kids aged 8mths, 4, 5, 7 and 8 years. 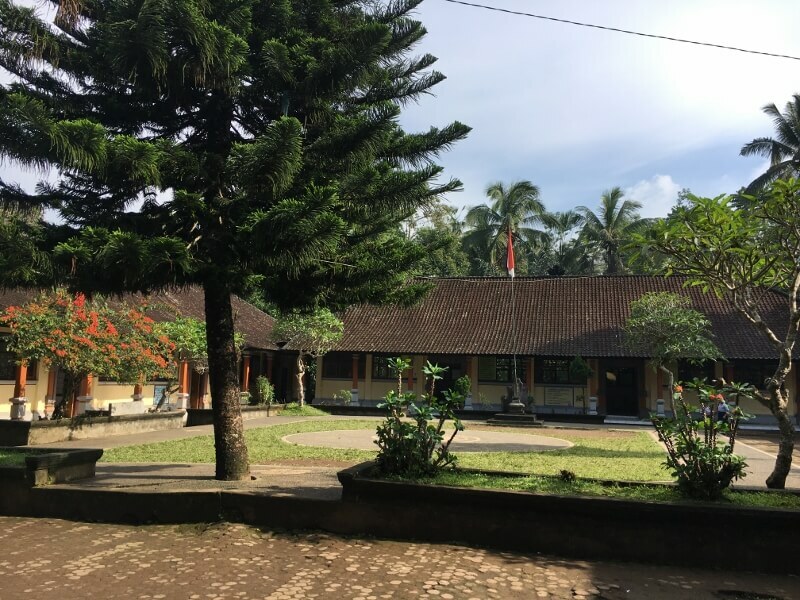 We were driven through the beautiful Bali countryside and 40 minutes later arrived at the local Bali school. 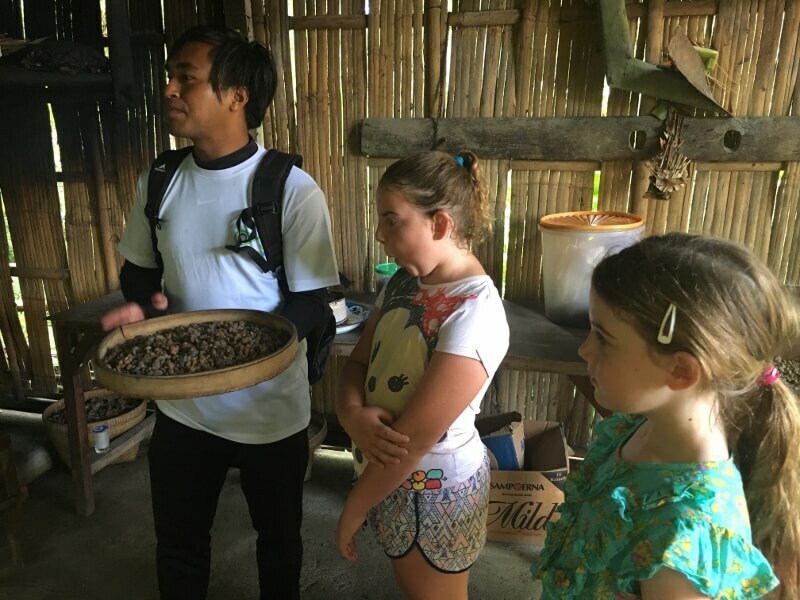 Here we met Komang our awesome tour guide for the day. He was so lovely and excellent with the kids. 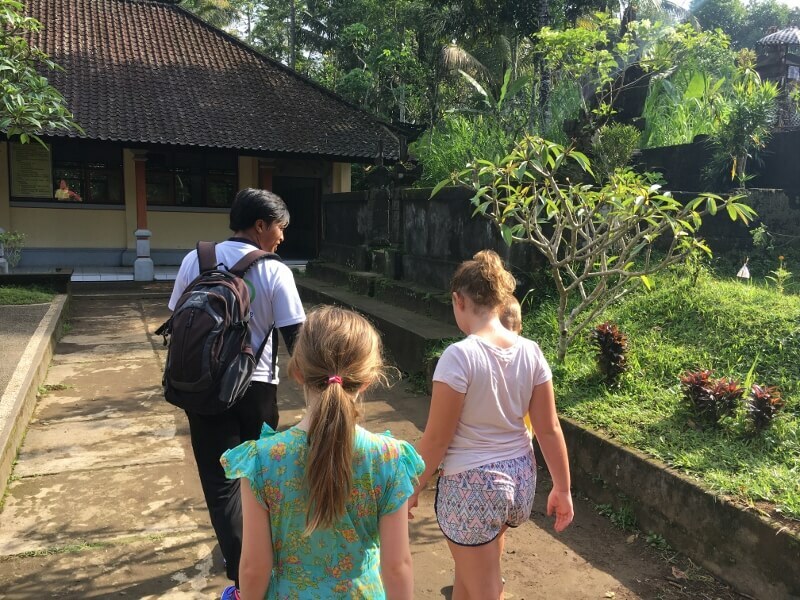 We were invited into a local Balinese school to have a look around and experience a Bali classroom, this took us about 15 minutes. 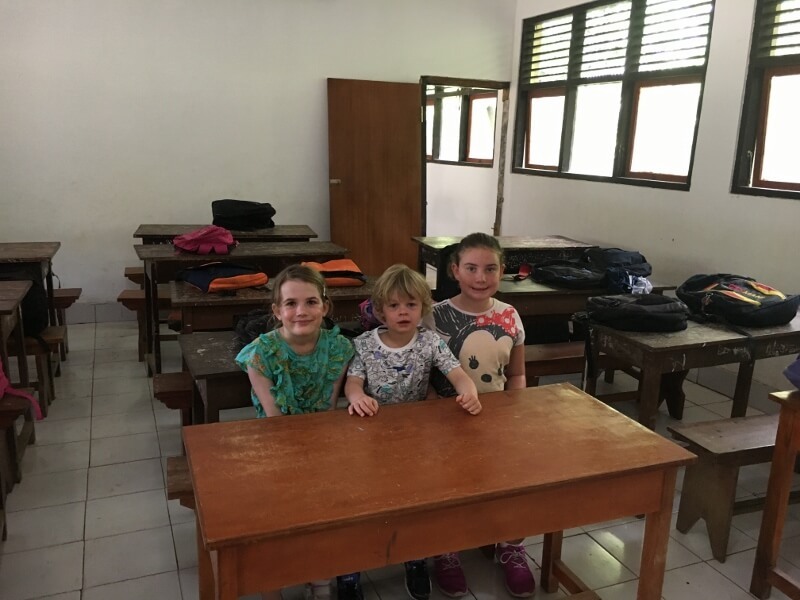 Such an eye opener for the kids to see how privileged they are to go to school in Australia and the wonderful facilities they take for granted. 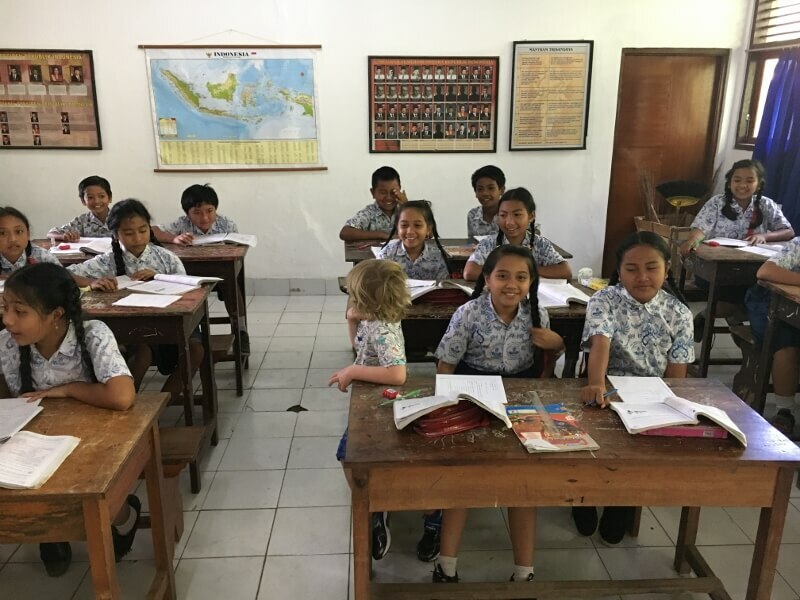 We were very impressed with how well behaved the Bali school kids were and their uniforms were very cute! Mason making himself at home in the classroom!! 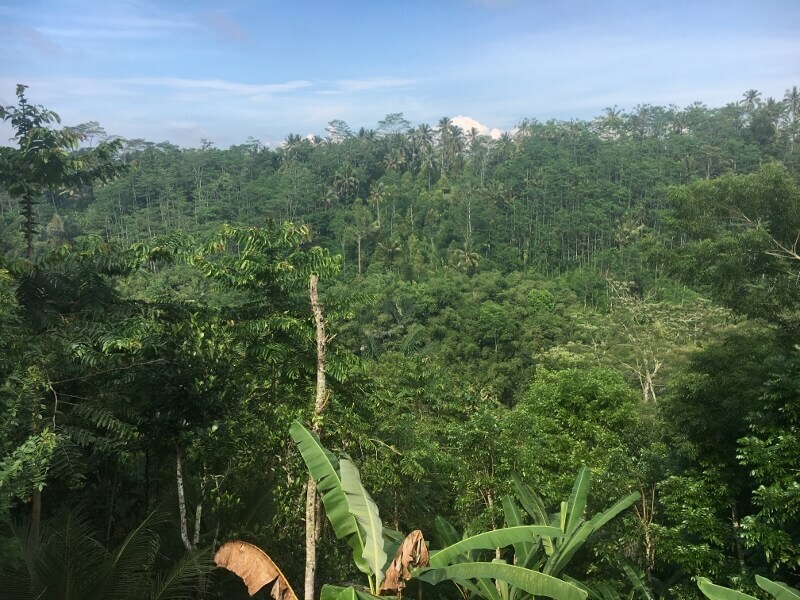 Next we jumped onto the bus and were taken a short distance to Abian Kusuma Sari Agrowisata on Jl Tampaksiring, a coffee plantation. 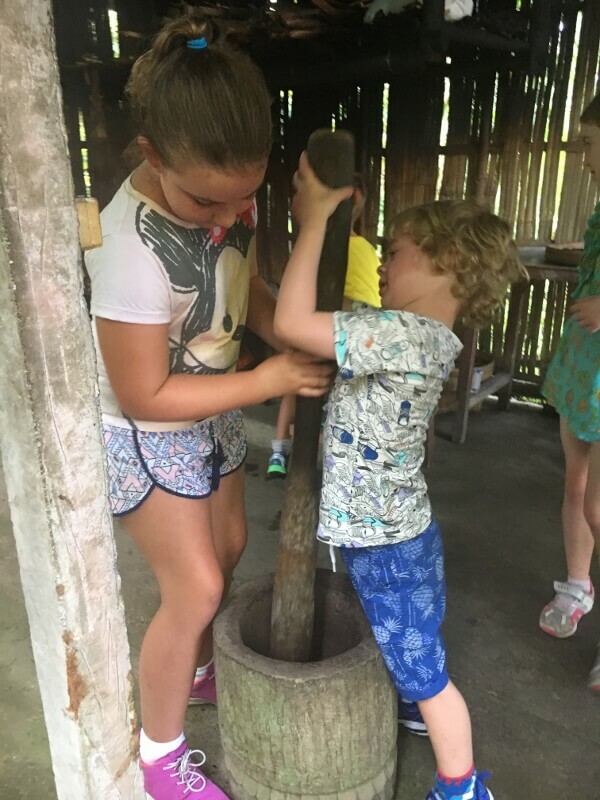 The kids loved this as we walked a short distance through the “jungle” as they called it and were able to see how they make Luwak coffee. 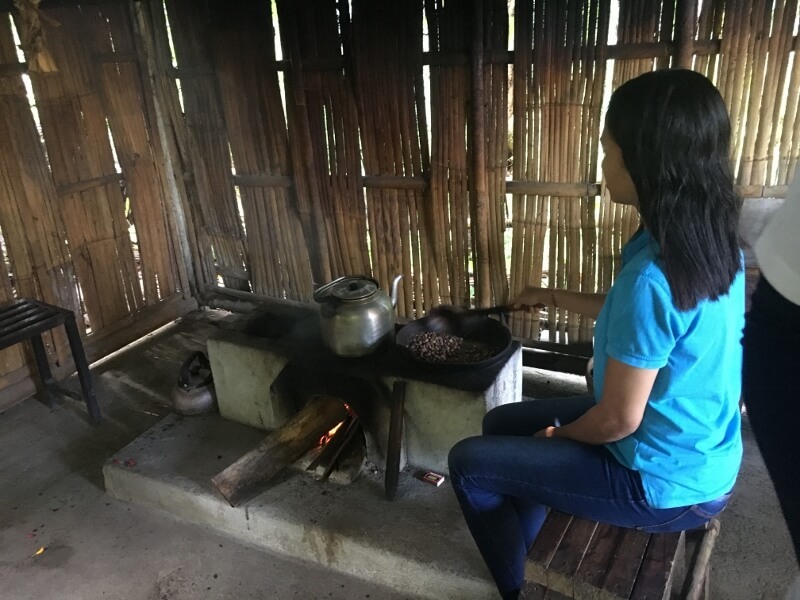 The kids were allowed to have a go at roasting the coffee and then we were able to enjoy a range of different teas. Coffee was available for an additional cost and there was toilets available. We bought a stash of chocolate at the gift shop for bribery later! This part of the tour was about 30 minutes long. 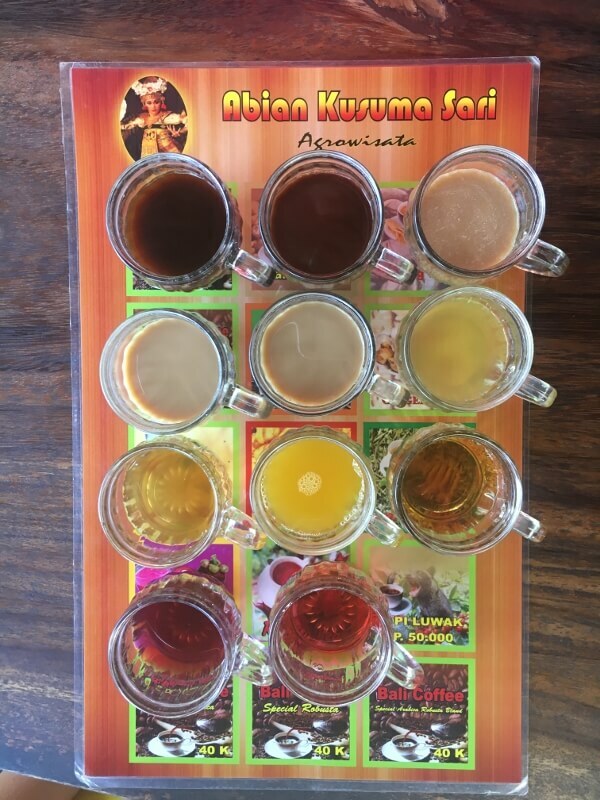 Maso loved all the teas!! 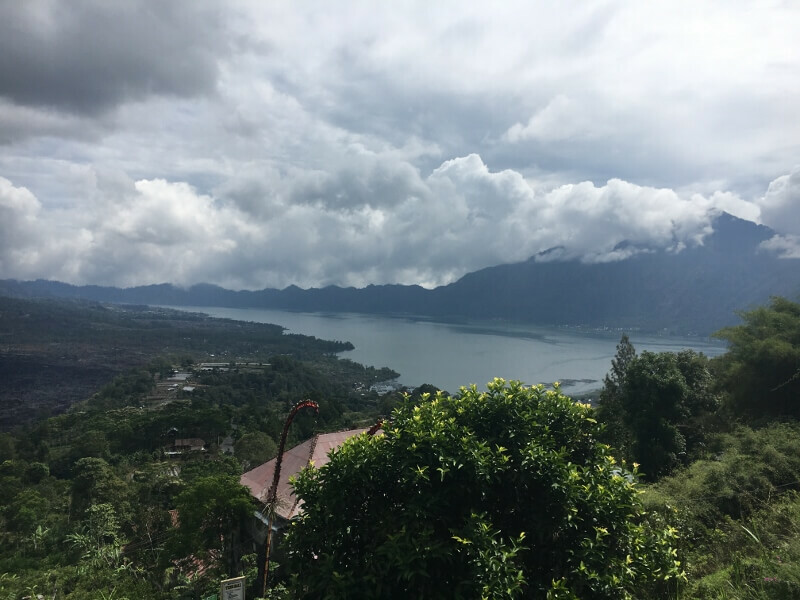 Once we all loaded back into the bus with water bottles that we bought cheaply at the carpark, we drove 20 minutes to the Mt Batur look out. 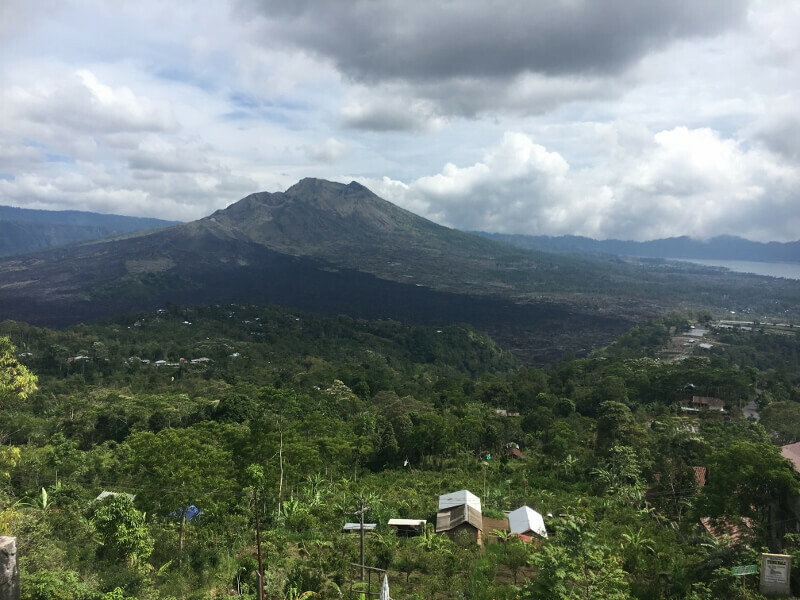 Here we were able to get out for a photo overlooking Mt Batur and get sucked into buying a sarong like I did, may have forgotten one and cheaper than the gift shop at the Padma! 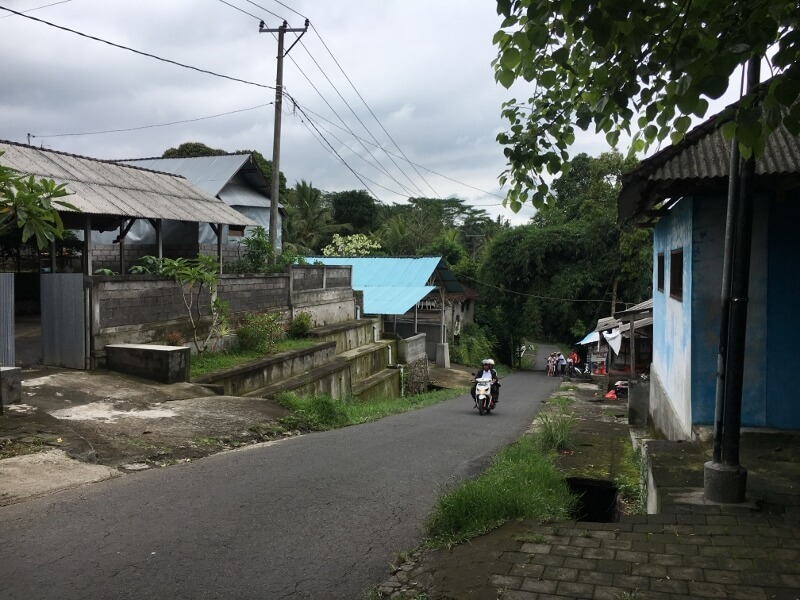 It was then a 30 minute drive to the starting point of the bike ride which was off the main road and hardly any traffic. Here we worked out what bikes we would ride and if anyone wanted to travel in the bus for the first part of the ride. Then we were off! 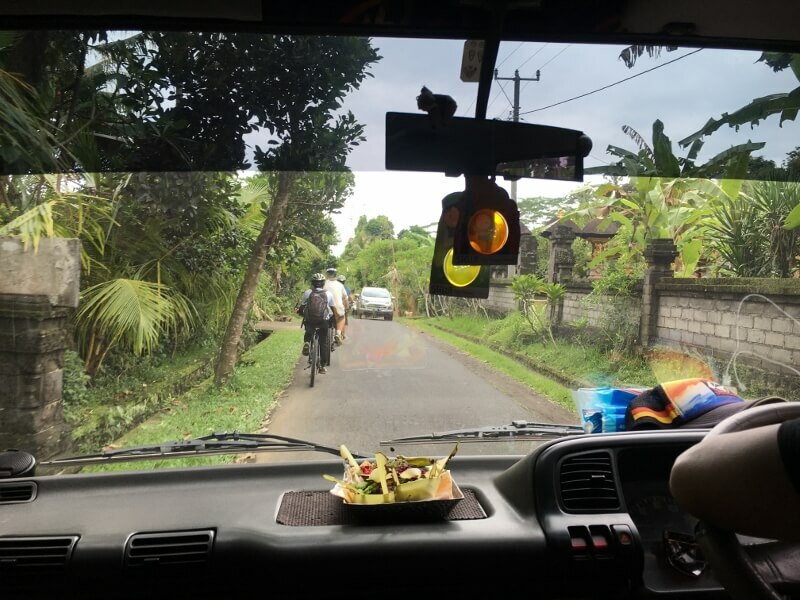 Experiencing riding through Bali villages was such a great feeling and it was not hard riding at all. Not much traffic and it felt like we were going downhill every so slightly! 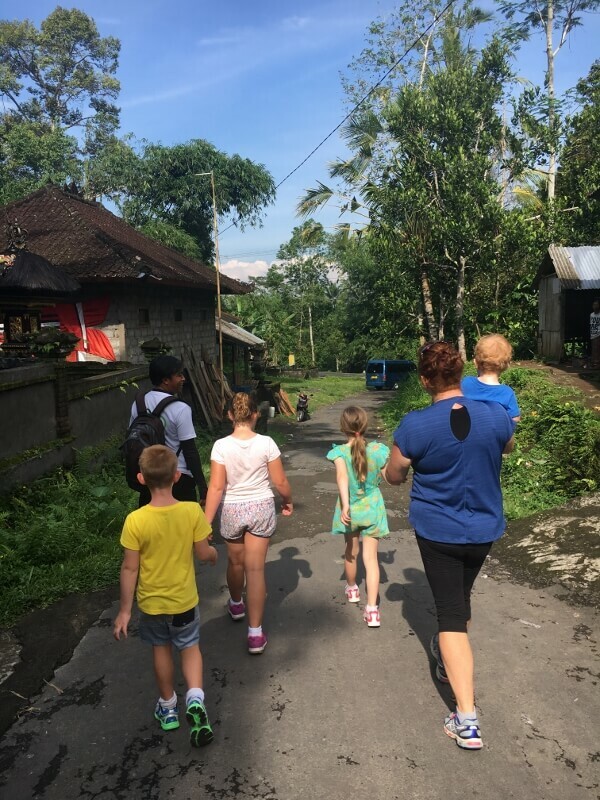 10 minutes into the ride we stopped at a Bali family compound and were shown around. 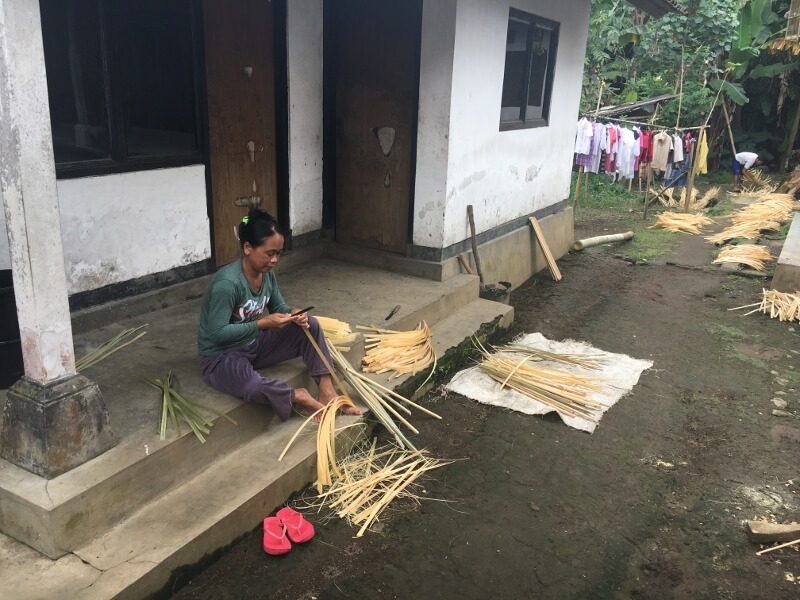 Such a great experience for the kids as they were drying rice and the women were weaving baskets. 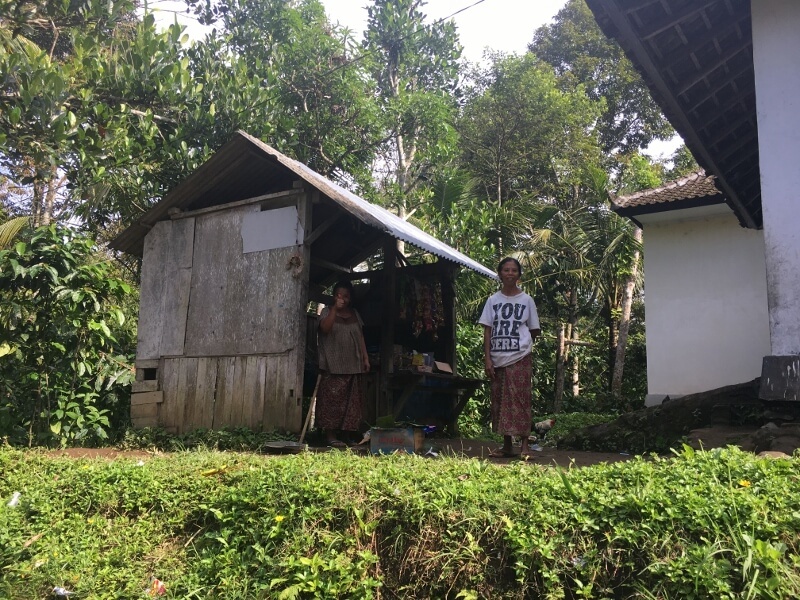 This is not a tourist spot but family members of Komang that very generously let us look around. 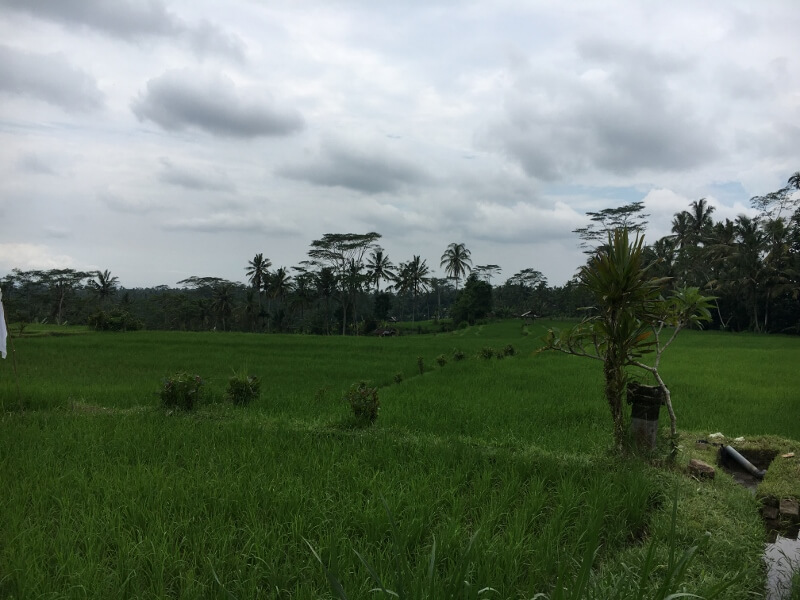 We were then back onto the bikes and rode on to see the most beautiful rice fields. 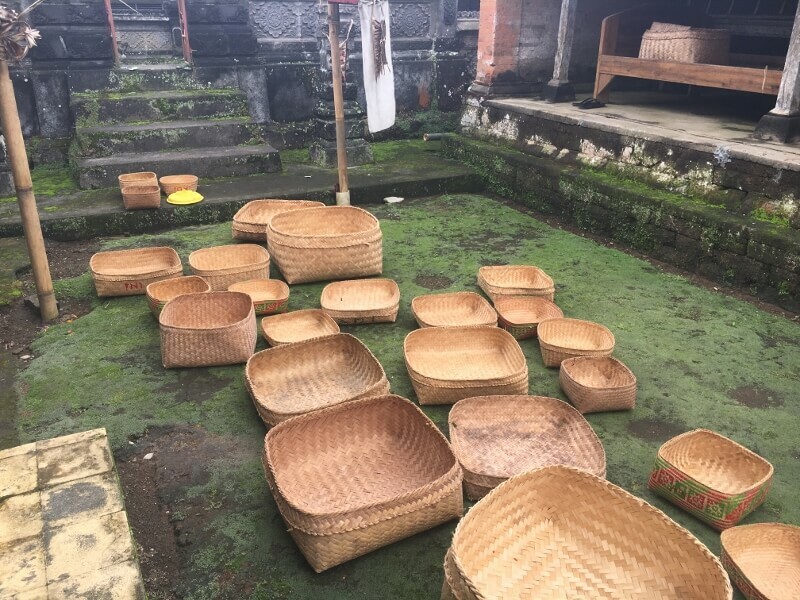 Ahh this was the real Bali!!! We rode for about 1 hour before we got to the first hill. It wasn’t huge but I may have got off and walked it. 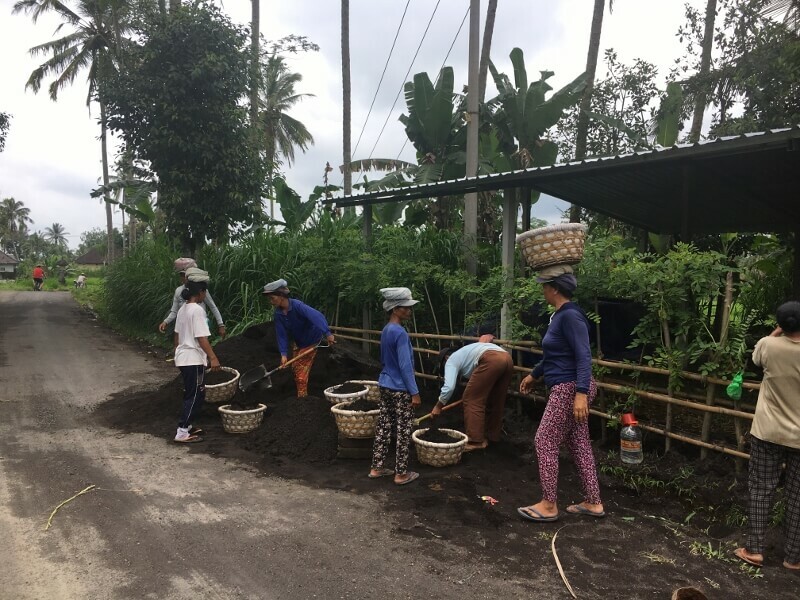 These are the hardest working women I have ever seen! The hill that beat me!! 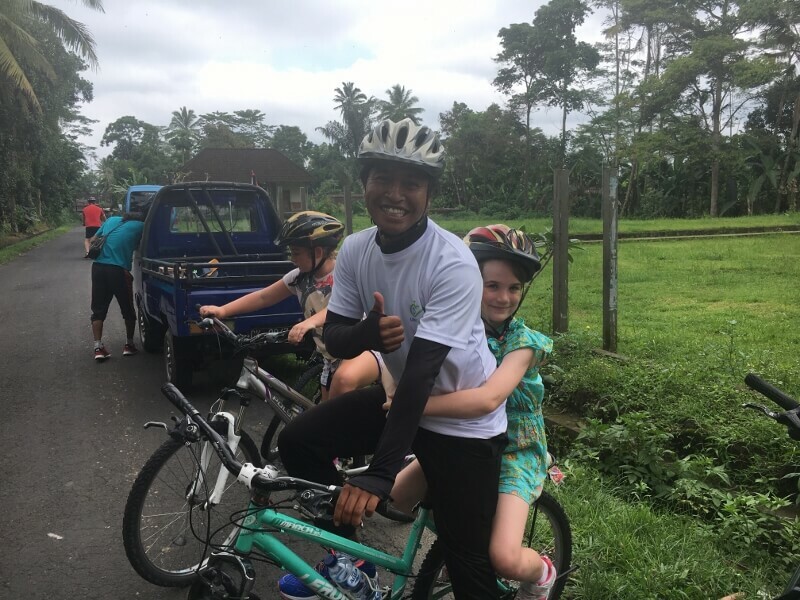 We then did a swap over as the youngest member of our group and his Mum were ready for a ride. I had a break in the bus with Mason who watched the iPad that we had brought along with us. He needed a chill out time and the AC bus was the perfect spot for this. The group rode on for another 30 minutes before we decided to finish as the kids were starting to get hungry. 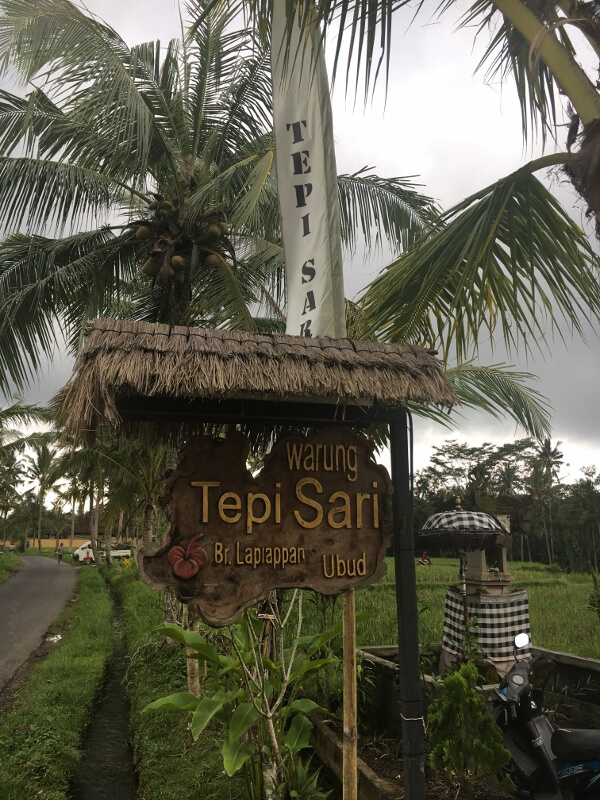 We all loaded back into the bus and were driven 20 minutes to lunch at Warung Tepi Sari, North of Ubud. 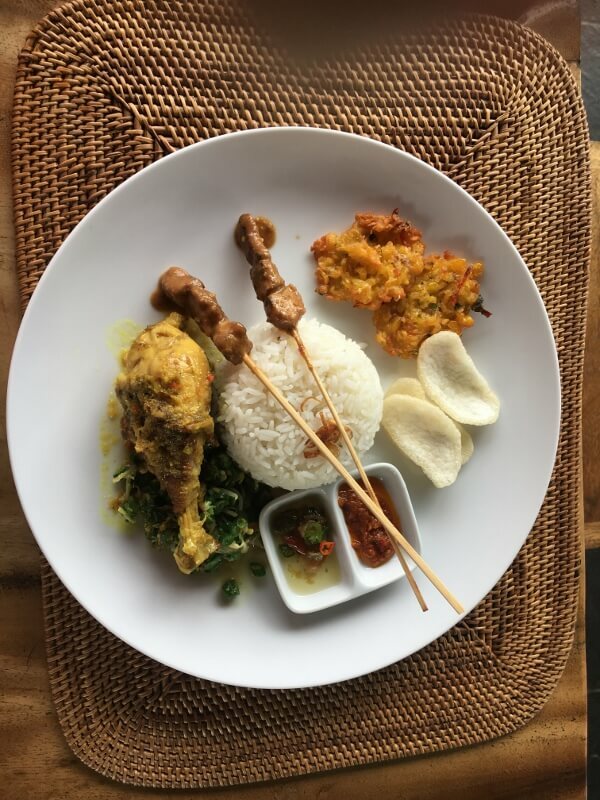 Lunch was included in the price and we enjoyed chicken satay sticks, rice and much more. The kids thought the lemonades were pretty cool! 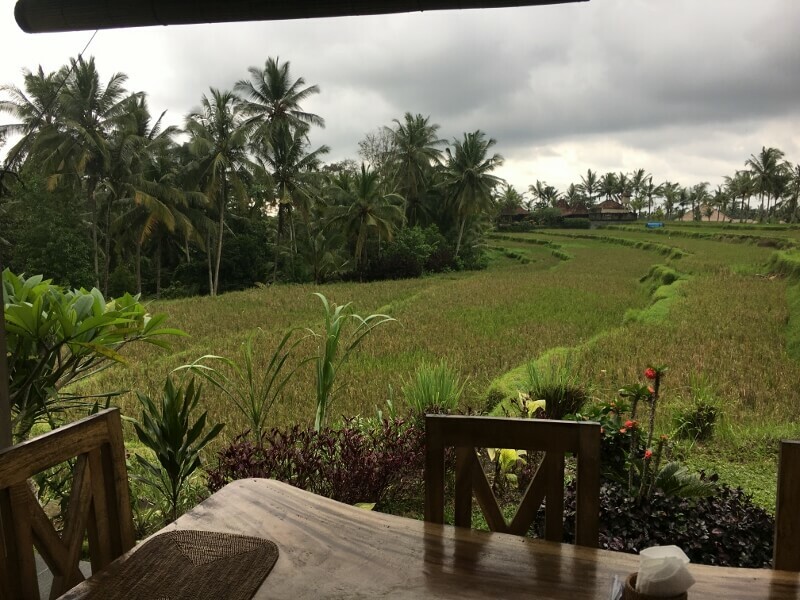 The drive back to Padma Ubud Resort happen just in time as the rain started to pour! We visited in November and found the best weather to be in the mornings. 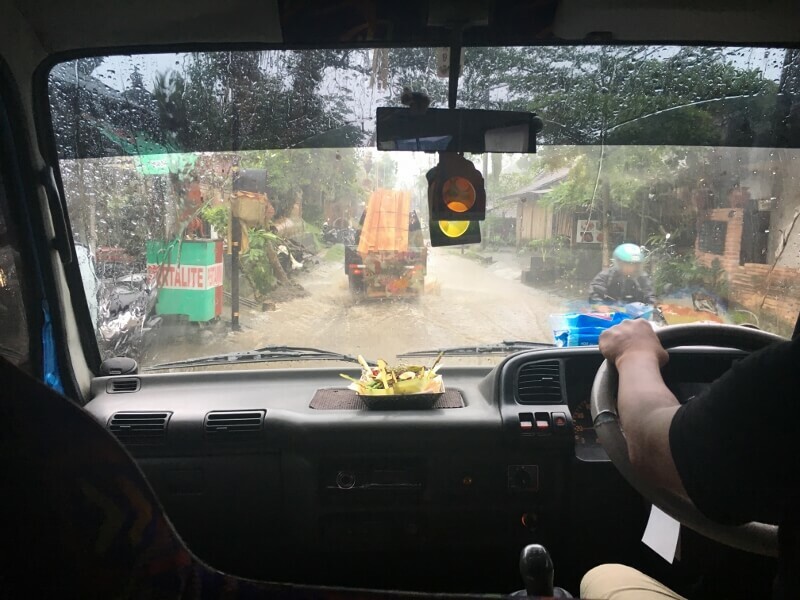 The rain on the drive back to the Padma Ubud! 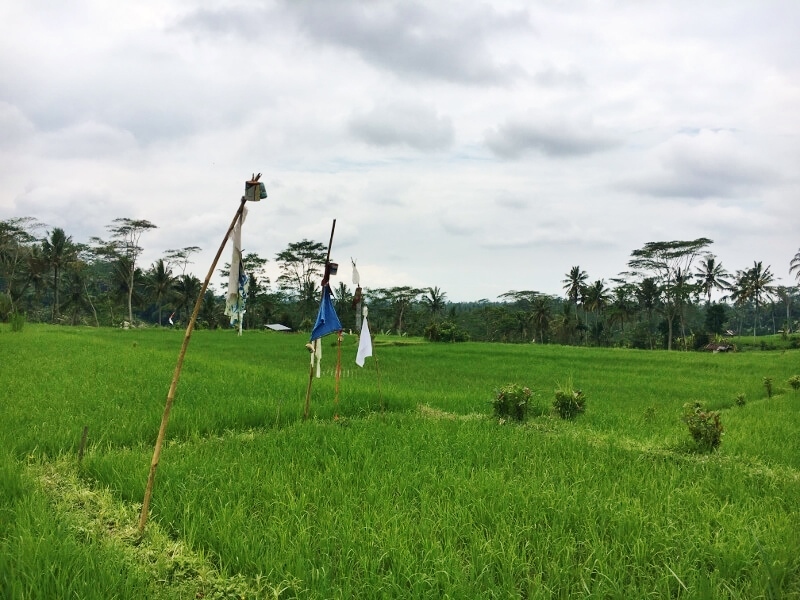 We researched a few Bali bike tours and we are so glad we chose a tour with Ubud Cycling Bike. 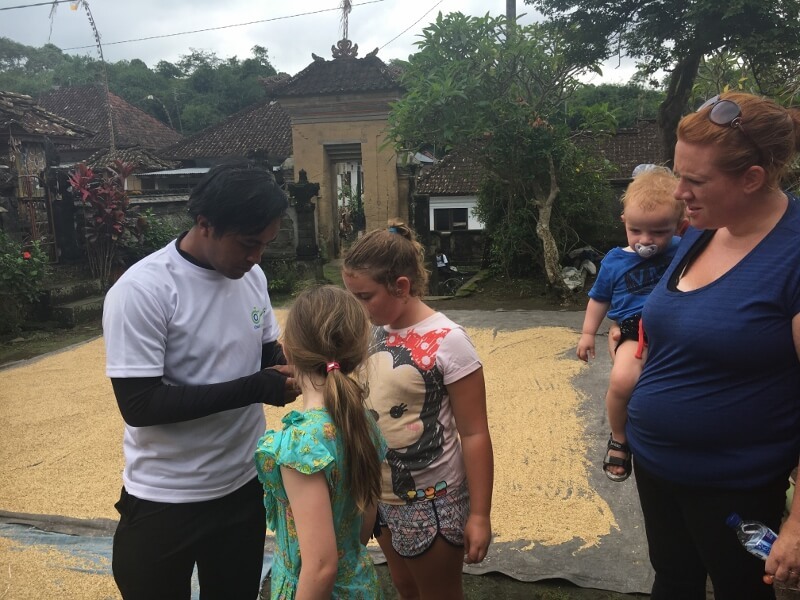 They were extra helpful and understanding of travelling to Bali with kids. 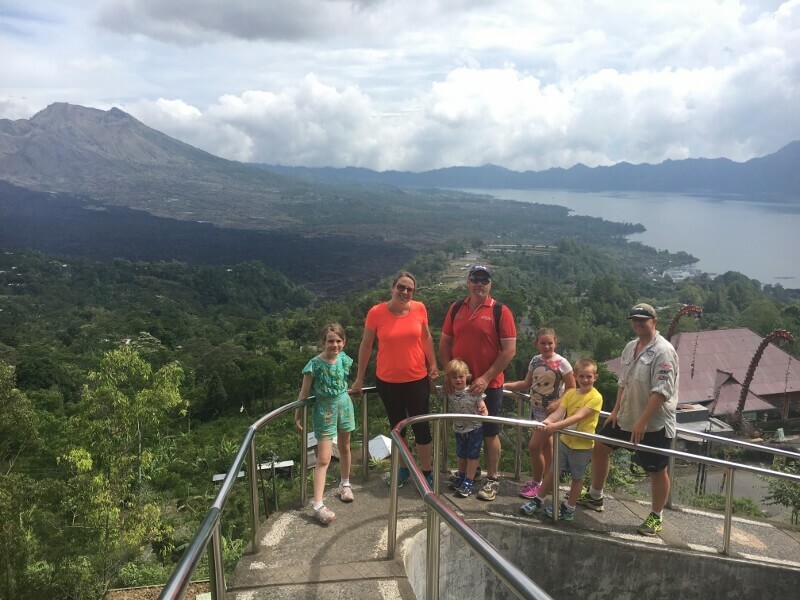 It is definitely one of our top things to do in Bali with kids and here are a few tips to make your day even better. 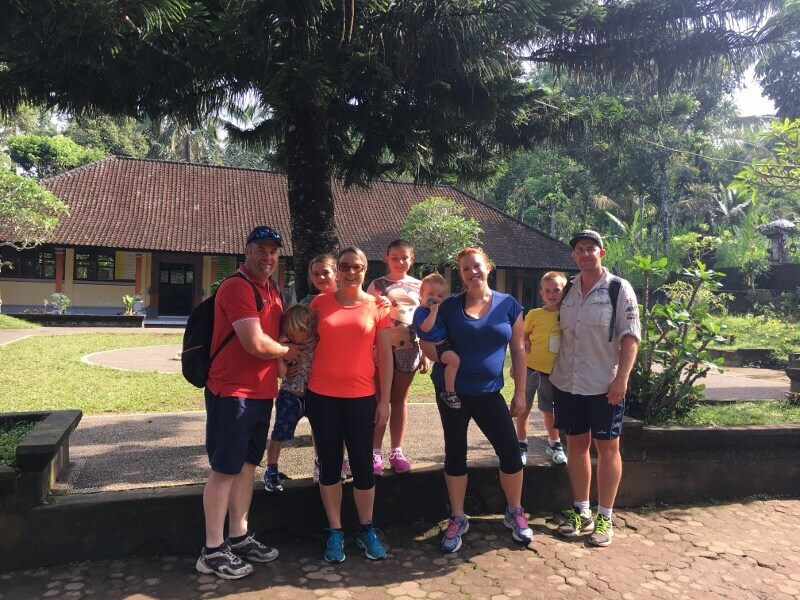 Pack runners when you are packing for your Bali family holiday. It’s not ideal to ride in sandals, so if you can fit them in you will enjoy the day more. Pack snacks for the tour that are easy to eat on the bus. There is a couple of places to get snacks but it’s easier with kids if you bring the ones they like. 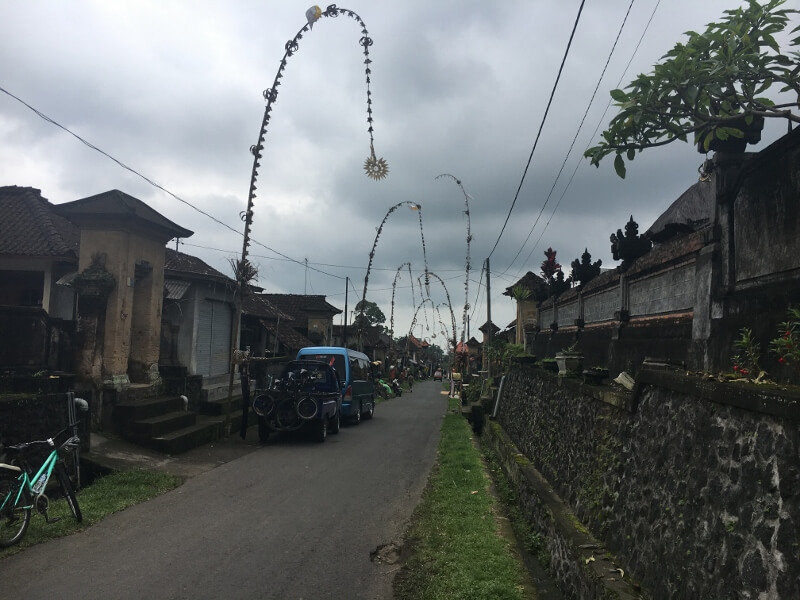 You will be with the bus for the whole day so feel free to bring a bag of goodies or pram to keep the younger kids entertained if they get bored. Put sunscreen on the kids before you leave and take sunscreen with you in your bag. If anyone suffers from car sickness pack a vomit bag. 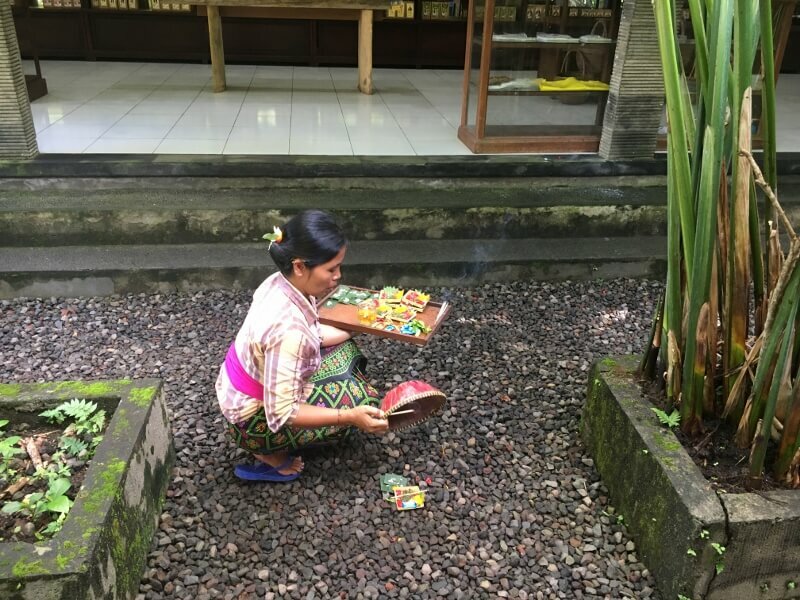 We always carry one with Charlotte as she is well known in Bali for being sick. We didn’t need it but handy just in case. 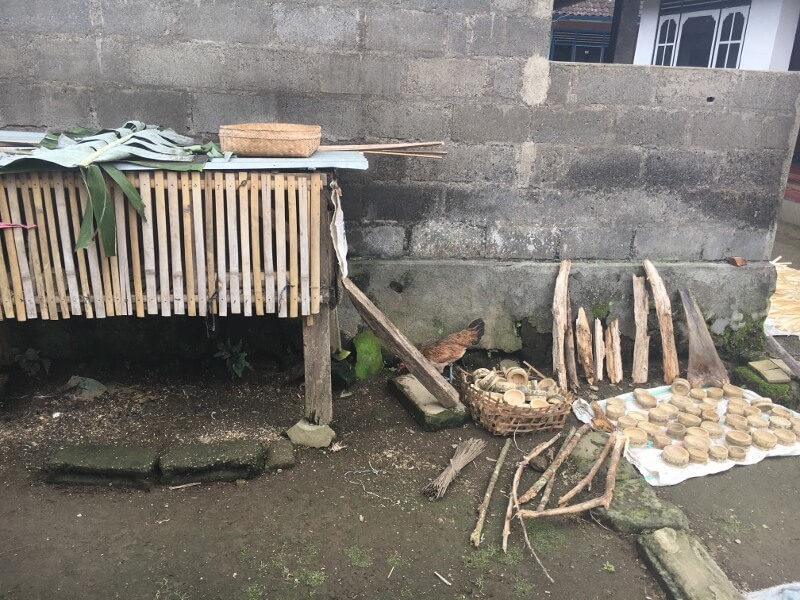 Have smaller rupiah notes in your pocket in case you want to buy something at Mt Batur or any of the villages. 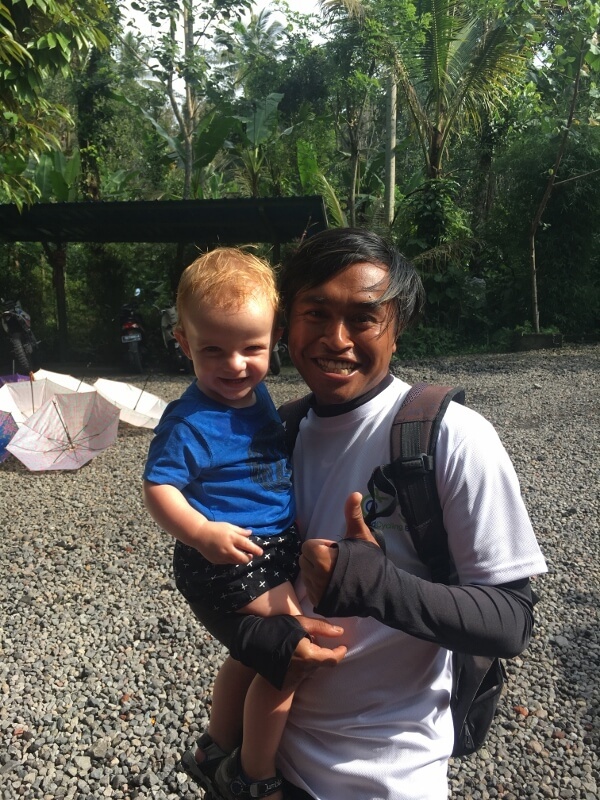 Komang is great at asking what you want to do and if you decide that you have ridden for long enough let him know. Likewise if you want to see or do more things let him know as he is very flexible. 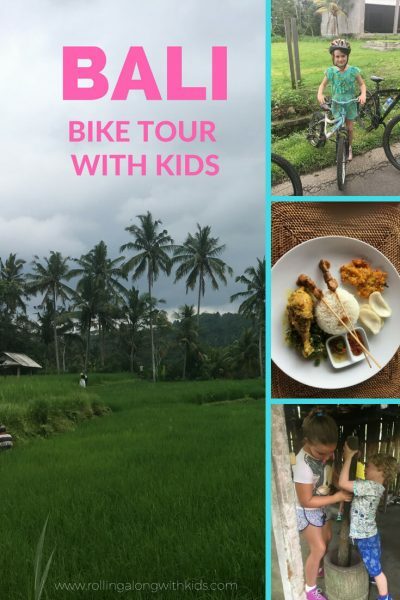 We hope you enjoyed our Bali bike tour review and it has helped you to decide if it’s right for your family. Feel free to come join our Facebook group, chat to us on Facebook or Instagram and you can also email us with any questions. Note: We paid in full for the bike tour and for all of our thoughts above we have received no payments.